→Common Damages of Trampolines and How to Fix Them? Common Damages of Trampolines and How to Fix Them? For most of us, bouncing is fun! No wonder there are plenty of trampolines everywhere. From our backyards to indoor gyms, to playgrounds, trampolines were being promoted as an efficient form of exercise for children and even adults. Likewise, trampolines are great for engaging everyone in the family in a fun activity. However, frequent use, extreme weather conditions, liquid and chemical spillage and other physical elements contribute to the fast wear and tear of trampolines. Once you see tearing in trampoline or damages, you should immediately fix it as soon as possible for safety concerns. This will also prevent you and the rest of the family to have trampoline-related injuries. What to Do with Damaged Trampolines? Trampolines could be expensive and having them repaired by service companies appears to be costly. Thanks to innovative persons and the internet as they made repairing damaged trampoline easier than we think. The safety net enclosure of a trampoline is prone to tearing. Apparently this is an important material in a trampoline as it keeps the kids safe. A small hole will eventually turn to a big hole until the whole net will be ripped that is a serious safety issue especially for smaller children. You have the option to replace the safety net, but that would cost you a lot of money. Safety nettings are subject to tearing because many reasons. You don’t need to be a seamstress to fix the safety net yourself. If the entire netting is in good condition, but with smaller holes, a heavy-duty upholstery thread might do the trick. You will also need an upholstery needle that is big enough to sew the net and of course, some basic sewing skills. Knot the thread on the netting and start “sewing” in a zigzag pattern. Repeat the process to make sure that it is tight enough. We are not sure how long this solution will work, but once the thread starts to come undone, repeat sewing the ripped parts. You can choose a fishing line since it is a tougher material. The mat is the most prone to damage as this is where the kids ﻿﻿jump. It can get easily torn by rocks, sharp objects or tree branches. It loses its strength from cuts making it vulnerable to extreme weather conditions. Look for holes or cuts in your trampoline mat. Check if you can patch the damage yourself or if you need to replace it with a new mat. For minor tears, you can use a heavy-duty duct tape. As a rule of thumb, trampoline mat with holes that are larger than 2 inches are meant for replacement. Usually when you purchase trampoline or trampoline mats, it comes with a patch kit that you can use to patch the hole. The patch kit includes instructions on the specific type of stitching you will use to efficiently weave the mat. Be sure to sew the patch’ edges several times for added strength. Cutting the excess material and place the mat back. If you intend to buy a ﻿﻿new ﻿﻿﻿﻿﻿﻿trampolin﻿﻿﻿﻿e mat, take proper measurements of the trampoline frame. Different models of trampolines can still have variations in sizes, although they share the same dimensions. Inspect the trampoline once the new mat or fixed mat is ready for use. These parts usually bend at the joints which reduce their load-bearing ability. Damaged to welds also increases the risk of collapsing. The best solution here is to ask the manufacturer or the store where you purchased the trampoline if they also have spare parts. It is also highly recommended to have someone expert at these to take a look. Do not substitute or modify the frames and poles using other parts such as screws or poles that you can found in the household. Frequent use and other elements can contribute to the high probability of pole bending. Fortunately, nets are easier to be replaced, but make sure to buy poles that have the same diameter as yours. Also, make sure that the pole securing points match with the pole quantity. In most cases, the net will fit the same trampoline model, but it is still better to check photos and cross reference with the manufacturer to get the right net poles for your trampoline. Again, do not use other springs that are not intended for trampolines. Make sure to buy a matching spring if yours are lost for some reason. Measure it in millimetres, but it should be off the trampoline so there will be no tension from the mat. Some trampolines come with ladders for easy access. Should the ladder bent because of frequent use or due to storm, it is always easy to buy a new one for the replacement. Take proper measurements of the trampoline frame and purchase a ladder that is at least 15 cm longer than the frame’s height. This one is also easier to replace by buying a new one. Just measure the diameter of the trampoline frame to order it online. Apparently a trampoline also requires maintenance. One should invest time for inspection and a little money to keep their trampoline in good condition. If your trampoline is placed in your backyard or in the garden, expect that it can easily get damaged due to strong winds, sharp objects, changing weather and other conditions that we cannot control. 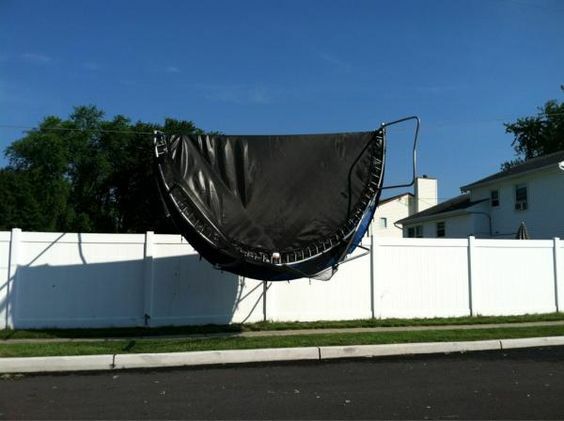 To prevent fast wearing and tearing, make sure that the trampoline is properly anchored. Larger trampolines are more prone to cuts as these are more likely to become airborne. The good thing is, most of these damages are repairable and the parts are replaceable. Before purchasing anything for your trampoline, just make sure that it complies with the safety standards and materials as required by the manufacturer to avoid further damage of the trampoline. We do not also want to take risks in terms of our family’s safety so better be sure than sorry. I purchased my trampoline 5 years ago for my grandchildren to enjoy when they visit, so it is not used daily. Now my jumpers get black stains on their clothes and skin from the trampoline mat. I tried scrubbing the mat with a broom and laundry detergent but that did not help. What is causing this and what can I do to resolve it? You read this post. I hope it can helps you.